What is the Standard Share and How Much Food Comes in it? How do I add eggs or coffee to my share? 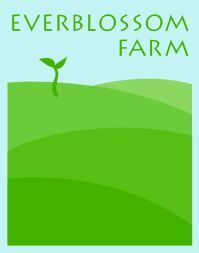 Is everything that's grown on Everblossom Farm Certified Organic? What if I go out of town and miss a pick up? Or simply forgot to pick up? What Is A CSA and How Do I Sign Up For It/Are there payment options? What Will I Get In My CSA Shares and Does It All Come From Everblossom? When can I join the CSA/What are the Seasons/Is it Year Round? Mash garlic, sage and salt together in a bowl or with a mortar and pestle. Knead mixture into the turkey and season with pepper. Form into 4 patties and transfer to a plate. Cover and chill for 30 minutes to allow the flavors to blend. Heat a non-stick skillet over medium heat. Add burgers and cook until firm and lightly browned, 4 to 5 minutes on each side. Check that turkey is completely cooked through. Serve on toasted rolls with a squeeze of lime. Summer 2016 CSA Registration is Open! Summer 2016 CSA starts in May! Introducing Lemmon Twist, our blog that is soley for your cooking endeavors. We hope that you find some family favorites and new, delicious ways to prepare Everblossom's fresh, organic provisions. 10/6/16	When can I join the CSA/What are the Seasons/Is it Year Round? 10/6/16	What is the Standard Share and How Much Food Comes in it? 10/6/16	How do I add eggs or coffee to my share? 10/6/16	What if I go out of town and miss a pick up? Or simply forgot to pick up? 10/6/16	What Will I Get In My CSA Shares and Does It All Come From Everblossom? 9/18/16	Tomato Canning Sale on the Farm this Week! All content property of Everblossom Farm. 6363 Carlisle Pike, East Berlin, PA 17316.